My parents Patrick and Annette stayed in and around Ramatuelle for nearly 40 years, visiting two or three times a year outside the harvest, planting or shooting seasons for about three or four months in total, as the dry warmth and swimming helped ease my mother's arthiritis. They built up a wide circle of friends who either lived there, such as Pol and Poppett(Pol), and others who visted regularly such as Patrick Heyworth, Felicity Hindson, Griff Kewley, Bridget Mill, Carolyn Maguiness, Jim & Sue Meyrick, Juliette Oram, George & Yvonne Robertson, Ursula Segwick and a number of Swiss, Belgian and French friends. They never bought a house there, preferring to rent, mostly from an American, Ruth Wise, or from other friends. They bathed and picniked almost every day at L'Escalet and in the evenings ate in the restaurants under the great ormeau (elm) tree which had been planted in Ramatuelle square by Sully in the 17th century, or in the neighbouring Saracen towns such as at Gassin. Part of the fun was the drive there and back, which usually took three days and allowed them to stay at lovely small hotels and pensions, with hoteliers who got to know them well over the years. 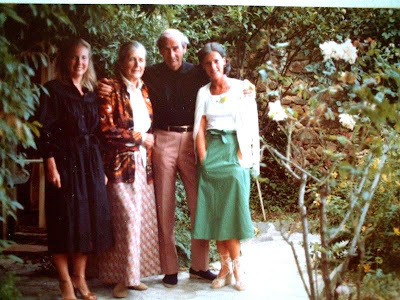 My father's last visit to Ramatuelle was in August 1998, when he attended the Les Azuriales Opera with us on Cap Ferrat, and we drove him there.